This is a film that should be incredibly easy to make enjoyable; it’s an action-comedy starring two A-list actors known for their great comedic timing, with a nonsensical plot that still offers more than a few interesting possibilities in its set-up, and has a strong sense of humour to counteract its occasionally gritty violence. Unfortunately, The Hitman’s Bodyguard still manages to come up desperately short, because it fails to grasp the many opportunities dangling in front of it and just sticks to being a wholly generic action movie that doesn’t even attempt to be any different to the countless others. In the film, Ryan Reynolds places Michael Bryce, a former triple-A rated protection agent who, after his last client was assassinated while he was on the job, is now left protecting far lesser clients like a coked-up and bug-eyed Richard E. Grant (in a pointless cameo role). Meanwhile, at the Hague in Amsterdam during the trial of a nefarious dictator (Gary Oldman, collecting another easy pay-check in a role he probably filmed over a weekend or two), the court calls for deadly, and incarcerated, hitman Darius Kincaid (Samuel L. Jackson) to appear as a witness, but his convoy is attacked en route by mercenaries and forces Interpol agent Amelia (Élodie Yung) to contact her ex – none other than Bryce – to give Kincaid a safer passage from the UK to the Hague. And thus begins a tale of two opposing personalities in constant battle with each other, with plenty of quips and action sequences to pad itself out to just under two hours, and it’s exactly like any other buddy action movie you’ve seen before in your life, but not in an endearing way. From the very first few scenes, you know exactly what kind of movie this is, and it delivers in remarkably unspectacular ways. The plot is a hopelessly recycled collection of greatest hits from every buddy action movie ever made, and it’s both written and shot as though it should be one of those direct-to-video trash entries, but because of the talent involved it somehow got bumped up to a theatrical release. It’s not only dully predictable from minute one, but it’s also slightly obnoxious in how dully predictable it is; as it turns out, Kincaid’s convoy is attacked because there is a mole in Interpol (an Inter-mole?) planted by Oldman, and wouldn’t you know it, the mole turns out to be the guy who’s played by the guy who plays a corrupt guy in every single movie he’s in. Again, this is the sort of genre movie with its old and stale plot and sense of humour that should probably have been given the direct-to-video route, but because it’s got the likes of Ryan Reynolds and Samuel L. Jackson in the starring roles it’s in cinemas, and it’s not any better for it. Like a lot of these buddy action-comedies, this one lives or dies depending on the chemistry between its two leads. Both Reynolds and Jackson are tremendously talented actors who can not only be convincing and even intimidating when in serious action-movie mode, but can also be absolutely hilarious because of their fantastic comedic timing and genuine on-screen charisma. Here, though, their chemistry is completely serviceable, but that’s about it; no amount of wit and back-and-forth roasting between each other can disguise how both are playing characters you don’t really sympathise with or even care about, and you mostly just find them – Jackson especially, no matter how much fun he seems to be having here – rather annoying and, in Reynolds’ case, whiny and insufferable. Together, you can see the sparks lighting up their shared on-screen presence, but individually you just can’t get behind their mopey and snarky attitudes; Reynolds does a great straight man, and some of his deadpan expressions do earn some of the few laughs this movie generates, but his character is a massive prick who doesn’t allow his ego to let go of his past mistakes, at the expense of the relationships of those he admires, while Jackson is just a shouty and obnoxious laughing machine who thinks he’s far funnier than he actually is. The pairing of Reynolds and Jackson on-screen is something that should write itself, but for whatever reason director Patrick Hughes – the director of The Expendables 3, which suddenly makes a whole lot of sense that this is just as obnoxious – spray-paints generic mediocrity over this pairing and the basic idea of this premise, which with a stronger script might have actually been a fun send-up of action movies, particularly this type. But as an action movie, it’s messy and shot in such tight close-ups and kinetic camera work that it gives you a headache after a short while; and as a comedy, outside of Reynolds’ deadpan facial expressions and Salma Hayek shrieking it up as Jackson’s incarcerated wife, it’s mostly barren of laughs – there’s a couple of early gags involving urinating in a plastic bottle which seem to build up to a final pay-off that never, ever comes, and of course this is the kind of comedy that ends a scene with an out-of-nowhere fart sound. It’s just a giant collection of dull genre clichés that aren’t even executed well enough to be entertaining, and can’t help but feel like a gigantic waste of potential given its premise that opens itself up to many comedic possibilities. Sadly, The Hitman’s Bodyguard is a movie that’s not worth the protection. 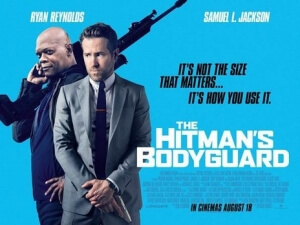 The Hitman’s Bodyguard is a movie that fails to grasp the numerous opportunities dangling in front of it and turns itself into an obnoxiously generic buddy action-comedy, one that squanders the potential in its premise and even the pairing of talented comedic actors Ryan Reynolds and Samuel L. Jackson to generate something dull, predictable, and not even that well executed to make it stand out from the numerous other films like it.